Thanks to the number of Thursdays on this year's calendar, visitors and residents of the Ardenwald-Johnson Creek neighborhood were treated to five concerts this August. 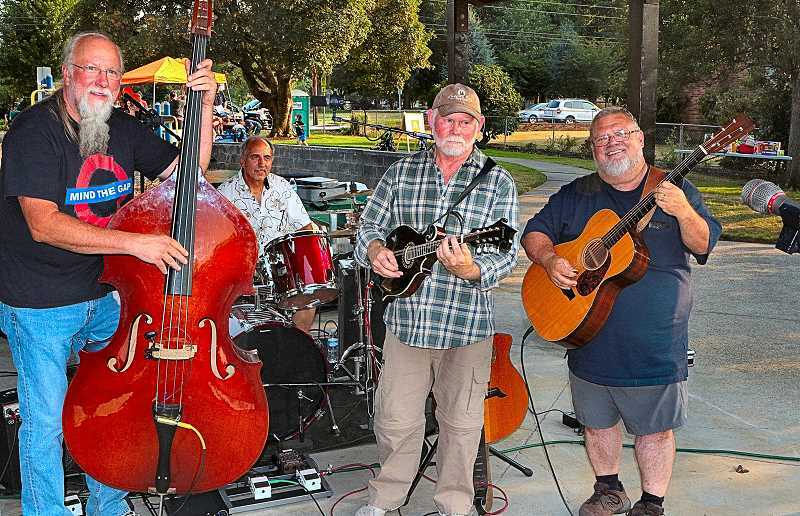 Their Thursday evening series kicked off on August 2 at Ardenwald Park with the neighborhood's "National Night Out" celebration, and music by the band, "Echoes of Yasgurs". At these concerts, kids enjoyed playing in a giant bouncy castle, and families happily munched free ice cream treats and slurped shaved ice cones, provided by volunteers from one of the concert series' sponsors, Hope City Church, which meets across the street at Ardenwald School. "Even though this concert series dates back to the 1990s, everyone still enjoys getting together to listen to great music, have a picnic dinner or snack, and participate in our free prize drawings," grinned the event's chief organizer and neighborhood association Vice Chair, Jeff Davis. "We're able to keep this event free, using our neighborhood grant money to help sponsor the concerts." The second week, at 7 p.m. the band "Ten O'Clock Hill" presented a well-received concert featuring modern folk, Americana, and bluegrass music. "And, we're grateful the volunteers from Hope City Church who are helping out so many ways," Davis told THE BEE. "It's great how they pitch in; they've been awesome to work with and very helpful." On the remaining Thursdays, the bands "Beat Patrol", "Remedy", and "Steve Hale and the Super Soul Heroes" entertained with blues, rock, and soul music, respectively. The Ardenwald Concert Series proved to be a delightful way to spend a summer's evening. If you missed them, they will be back next August in the Ardenwald neighborhood, just up S.E. Tacoma Street east of McLoughlin Boulevard. Ardenwald is a two-city neighborhood; part is in the City of Portland, and part is in Milwaukie.